I meet with key stakeholders for a learning needs analysis, asking ‘What do you want? What are you prepared to support? Where do you want your people to be at the end of this? What does good look like…?’ and if necessary drive a formal audience research project, asking ‘what do they want? What are their worries, needs and hopes?’ The findings inform the shape of the project. I establish formal workplace outcomes [desired permanent behaviour changes] and learning objectives [desired new knowledge, skills and attitudes] and create a Kirkpatrick evaluation plan. I brief the client on the story so far, and agree the next steps. I work with the graphic designer and the web team to develop branding and style with an early ‘proof of concept’ document, while the web team establish the technical support requirements for the website and the learning management system. Early in my involvement I begin to explore the full scope of possible solutions; everything we could do, plus their pros and cons. This takes some time, and is a creative, brainstorming ‘anything goes’ ideas stage. I consider different learning styles, and the need for engaging variety to keep interest, and.aim to provide an economical, user-friendly product. A blended learning approach might consider classic E-learning modules with formal assessments and user evaluations, some video and audio elements and guides to running action learning sets and discussion groups. A variety of PDF products suitable for mobiles, iPads and PCs to be accessed at the desk or on the move might include key point summaries of the E-learning material, practical checklists, typical scenarios to spark group discussions and sample reports and forms. I run a practical ‘post-it notes and flip-charts’ workshop, refining these possibilities down to realistic goals and likely products for the project, bearing in mind the needs analysis and the time, budget and people resources available. I then present the formal proposed solution to the client, including the individual products and their aims, risks and mitigations, technical detail and likely timescales as a map setting out exactly what I will deliver, with examples to demonstrate. I produce writers’ guidelines for the subject matter experts (SMEs) who will write the content, and create my document naming and storage system vital for consistency and ease of access and monitoring. Working closely to me, the SMEs write technical content for each type of product based on our learning objectives. Each first draft is then peer-reviewed within the team and I review for learning design, achieving objectives and plain English considerations. Later reviews might include interested managers and department representatives. Finally, all cleared material is signed off by the Legal team. Once the client is happy, PDF products go to graphic design and are published online. The E-Learning design process is carried out by a specialist contractor, who will design and build the modules in collaboration with the graphic designer and web team. After successful testing, the satisfied client signs off the finished module which joins the rest of the material on the website. Once the material goes live, user evaluations and feedback, pass rates and other management information are collected for review. 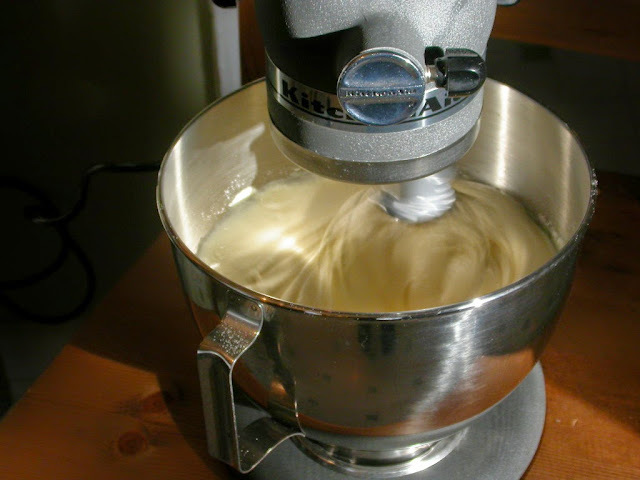 Image credit: KitchenAid Stand Mixer. Original uploader was Cmh at en.wikipedia – Transferred from en.wikipedia. Licensed under CC BY-SA 3.0 via Wikimedia Commons.